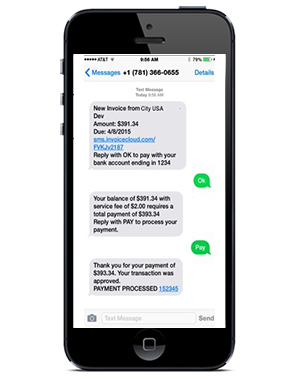 Many agencies and businesses are harnessing the power of SMS (Short Message Service) payments to bring convenience to their customers and reduce the payment cycle. PayConcierge provides your customers with the option to receive e-bills via text or e-mail, and allows them to make a payment directly from the e-bill reminder or text message without needing to navigate to a web or mobile page. One of the best things about Pay by Text is that it doesn’t require a card reader or even the newest phone. It’s truly mobile because customers can carry out these transactions anywhere, anytime, on any cell phone. Plus, it takes almost no time at all. As a matter of fact, the final step in the payment process with PayConcierge asks the payer to verify their payment information and also provides the options for both ‘pay by text’ messages and ‘paperless’ sign up. Both processes are 100% self service between PayConcierge and the payer.